As the lethargy of winter fades and the vitality of spring arrives, a tradition that induces an instinctive urge to clean comes to the forefront of our minds. Although some may better describe this urge as a sense of panic, I couldn’t help but feel a deepened curiosity toward the origins of this annual routine. Where did this desire to dramatically disinfect, tackle tidiness, or achieve asepsis originate? 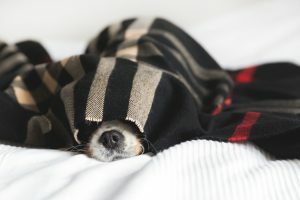 Cute dog under a warm cozy blanket. Was this cultural norm to thoroughly clean the house inspired by the sun beginning to hang around a bit longer each day, illuminating dusty corners more than usual? Was it perhaps a marketing scheme to sell more cleaning products? Internet conspiracy theories claim that it was. 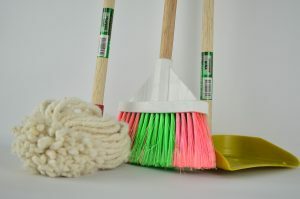 These theories can’t possibly be the only explanations for the commonly practiced seasonal task referred to by many as “spring cleaning.” The truth is, the tradition of cleaning the untouched crevices of our homes is actually a deeply-rooted medley of cultural, religious, and spiritual customs that were created centuries ago in countries and communities all around the world. 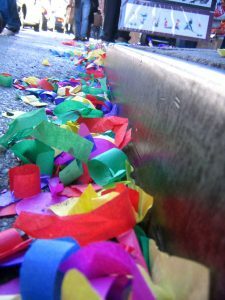 Street strewn with New Year confetti. When the Lunar New Year comes around in late January to mid-February, it marks the official end of winter according to the Chinese. In Chinese culture, it is believed that deep-cleaning your home rids it of bad luck from the previous year and fills it with good luck for the coming year. Superstitious traditions such as locking up all the cleaning equipment on New Year’s Day and waiting until after the start of the new year to sweep are unique to this culture. In addition, sweeping all the dirt and dust to the center of the room and discarding it only out the back door of the home is another ritual believed to protect the good luck of the family. 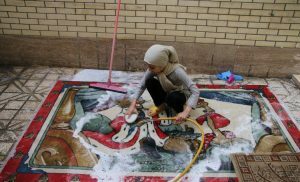 While diving deeper into spring cleaning customs around the world and what they symbolize, I stumbled upon a Persian holiday, celebrated in many regions such as the Middle East and Central Asia for over three thousand years, called Nourooz. The holiday falls on the first day of spring, as well as the last thirteen days. Nourooz can only begin after a specific spring cleaning ritual known as khaane-tekani, which literally means “house shaking,” is completed. This ritual includes cleaning parts of the house that may not have been touched for some time, such as carpets, windows, furniture, and curtains. It is typical for people who celebrate Nourooz to fill their homes with fresh flowers like hyacinth and narcissus during the celebration. Woman cleans rug as part of Nourooz. Not only is khaane-tekani focused on cleaning the physical parts of your home; it also is focused on spiritually cleansing the evil from a dwelling, as well. After spring cleaning is complete, the home is essentially cleansed for the start of the New Year and ready for guests who will be visiting for Nourooz. Although this next holiday is more recognizable among Westerners, I can ensure that you will learn something new about the specific origin of some of its traditions. To start, Passover is a Jewish holiday celebrated in April which pays homage to a time when ancient Israelites fought to free themselves from slavery in Egypt. The Book of Exodus recalls that they left in such a rush that there wasn’t even time to let their bread rise. This explains why today, people who celebrate Passover only eat matzah, a flat, unleavened bread made without yeast, during the holiday. 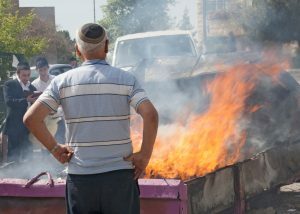 Chametz burning for Passover as a man looks on. Chametz, leavened food, is prohibited during Passover. Jews may spend many days, or even weeks, trying to remove chametz from their homes. They will begin by going through their kitchens and removing any trace of chametz. On the night before Passover, a ritual search for any remaining bits is carried out and a series of special prayers is said to take care of any chametz that was left untouched. After all the chametz is collected, it is either sold or donated to non-Jews, or it is burned in a bonfire. This meticulous cleaning ritual is performed not only in remembrance of the Jewish ancestry and culture, but also to remove the spiritual chametz of egotism and oppression. The superstition behind this tradition is that all the negativity from the previous year will be banished, and from the ashes of the fire, a new year can begin. To get the devil out, everyone must clean their homes thoroughly and sweep all garbage into a pile. Some people who celebrate Quema del Diablo simply burn their piles; others choose to top their garbage with a literal Satan figure, usually made out of papier-mâché. Some cities even have communal bonfires to celebrate the holiday, which include added festivities such as music and fireworks. Again, we see a symbolic connection between physical and spiritual cleanliness. A mop, a broom and a dust pan. Unlike the traditions described above, the Western idea of spring cleaning typically carries little to no religious or spiritual weight. For most Americans, it symbolizes the time of the year when we begin to regain control of our homes in terms of organization and cleanliness. The winter months have created habits of laziness and neglect. Other than our excitement for more sunshine, once all of the cleaning is done, there isn’t much thought put into its spiritual symbolism. For the majority of Americans, chores like removing dust from tabletop picture frames and vacuuming under the sofa, which most likely holds a meal large enough to fill the belly of a small child underneath it, hold no religious or spiritual significance whatsoever. Spring cleaning is simply a tradition people have witnessed their families carry out each year, or have been forced against their will as children to help complete. Check Your Windows: Since you’re soon going to be opening your windows to let the fresh air in, make sure to check that your sash balances are working properly. When you lift your window up, it should stay up. If it drops down, this means you need new window balances. For cranking windows, make sure the window operators are in good shape, and replace them if they are not. While you have the window open, be sure to clean the gunk from the inside of the window frame. Finally, screens are very important to check up on. Make sure your window screens don’t have any tears or damage, so summer critters can’t get in. 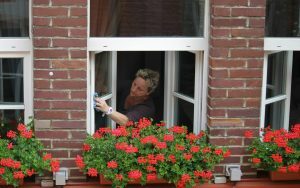 A woman wipes the panes in a casement window. Maintain Your Doors: While clearing out winter coats and old wrapping paper from Christmas, check for loose rollers or guides and replace any broken hardware on your closet doors. Wiping down the outside of each door in your house is a good idea, as well, and since you’ll be using your patio doors more often, check to make sure that your patio door handles work and the doors open smoothly. If not, consider swapping out some hardware or changing the height adjustment on the rollers to keep the door square in the track. Unclutter Your Storage: It’s time to finally re-organize that kitchen junk drawer that barely closes, and even your bathroom medicine cabinet. Double-check that all the hinges on your cabinets are in tip-top shape, and give each one a good wipe-down. You’d be surprised how much grime builds up on your cabinets over time. While you’re there, check that your drawer tracks, handles, and other hardware are all in working order. If the drawers have trouble sliding, a bit of silicone spray on the drawer tracks will smooth them out. Polishing silverware and re-organizing closets are also some good final touches to wrap up your spring cleaning. In the West, spring cleaning has simply become an unconscious ritual that creeps up on homeowners after the fog of winter laziness has worn off. However, my insatiable curiosity led me to discover the real reasons behind this tradition, and much to my surprise, a tradition we have habitually followed is deeply rooted in customs created mostly in the Eastern parts of the world. Learning about the customs of other countries has given deeper meaning to a tradition I typically deemed bothersome. Cleaning dust and dirt from our homes gives them an aesthetic advantage, but it also represents an expulsion of the year that has passed and a clean slate for the year you have just welcomed. I find it a shame that we don’t have little nuances and superstitions attached to our spring cleaning habits—regardless of the melting pot of religious and spiritual beliefs that make America up. Let’s be honest: collectively burning the dust and dirt from my home with all of my neighbors, jamming out to some music, whilst sipping a cocktail sounds like a heck of a good time to me! How did the true meaning of this Eastern tradition (which was to cleanse the home and create good luck for the new year) get lost in our interpretation? Is it because we are a society too diverse to streamline so many traditions into a single unique celebration? At the very least, as we wrap up our spring cleaning, we can appreciate the different cultures around the world that contribute to the traditions we find important. So, this spring, as you wipe the sills of your windows or grease up the tracks of your closet doors, remember that there is a great big world out there, filled with diverse views, rich cultural traditions, and beautiful people just waiting to be understood. Kara Boggs is a Temple University graduate with a degree in English. Her love of writing has been known to inspire extremely poignant birthday card messages to her loved ones. 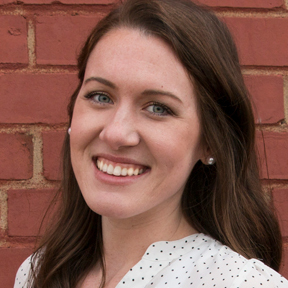 Blogging, editing, and reading poetry are some of her favorite creative outlets. Above all, though, Kara’s French bulldog, named Gemma, is the center of her universe. Sounds like a nice way for me to excuse myself for waiting months to clean my carpets and windows!